A magnificent, fine and impressive, large antique George V glass, English sterling silver and crocodile skin mounted hip flask; an addition to our silver mounted glass collection. 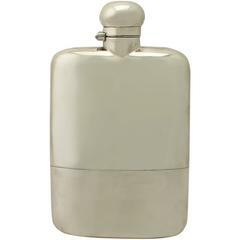 This magnificent antique George V sterling silver hip flask has a rectangular form with rounded corners. The upper portion of the large glass body is ornamented with an impressive crocodile skin covering. This impressive flask is fitted with a plain domed fully hallmarked hinged cover, securing with a bayonet fitting. This large crocodile skin hip flask retains the original hallmarked push fit drinking cup. The underside of the drinking vessel incorporates the volume marker '1 1/2 PT', in addition to the retailer's mark 'Drew & Sons, Piccadilly Circus W, Makers to the Royal Family'. Such large, oversized examples are becoming increasingly difficult to locate. This antique hip flask has been tested for water tightness and is ready for use. To ensure the flask remains water tight, the cork should be moist and therefore fully expanded to provide an effective seal. There are two recommended methods to ensure that the cork does not dry out and shrink: Method One: Keep fluid in the flask at all times, and keep the flask on its side to ensure the cork remains wet. Method Two: Fill the flask to the brim with fluid and close. Leave it like this overnight, or for 24 hours if possible, before use. Condition: This large crocodile skin hip flask is an exceptional gauge of silver, exceptional quality and in exceptional condition. The flask has been professionally polished and is in presentation condition. The glass is in perfect condition and the crocodile skin covering is in the original presentation condition. Full hallmarks struck to the surface of the drinking cup and the cover are all very clear; the hallmarks are struck deeply due to the exceptional gauge of silver. Reflections in photographs may detract from the true representation of this piece of antique silverware. Dimensions: Height 21.6 cm/8.5" Height of drinking cup 7.5 cm/3" Width 12.5 cm/4.9" Depth 5.3 cm/2.1" Maker: James Dixon & Sons Ltd Date: 1925 Origin: Sheffield, England A video of this Fine piece is available upon request. This large crocodile skin hip flask is an exceptional gauge of silver, exceptional quality and in exceptional condition.